In the sixth episode of the series, the aunties answer a dilemma sent in from 24-year-old Naomi from London, who is openly bisexual but worried she might be inexperienced with women. Naomi asked: “I’ve always been out and proud as bi and involved with LGBT stuff at university. “However, I’ve just got out of a long-term relationship with a guy and worry that I’m inexperienced when it comes to women. “I’m worried other queer women will see me as a fraud as I’ve never slept with a woman, despite being openly bisexual. Our agony aunts shared their advice for Naomi. “Miss Campbell darling! It’s more about your own personal journey,” Rhys said. “Just take it slow to be honest – explore, meet new people, when you find that person you feel comfortable with, you’ll know,” Karnage advised. Lee Gray added: “First of all, we’re going to get rid of that word ‘fraud’ – if you are a bisexual woman, then you are a bisexual woman whether you have had any experiences or not. “It doesn’t really matter what you believe you should have done yet. “And if they are going somewhere, go with them,” Rhys joked. Episode one of Ask the Aunties saw our agony aunts help a 16-year-old from Argentina who is struggling with his sexuality. Lee Gray is a YouTuber and part-time podcaster with Karnage Kills – together they produce a podcast about black queer men’s experiences living and dating in London, called Wolves in the City. Karnage is a rapper and grime artist from north London, regularly performing on the queer scene. You can also listen to his tracks on SoundCloud. Rhys Hollis is a drag and cabaret performer, including at The Glory in Dalston, London. You catch him performing at Queefy Cabaret in London on June 8. 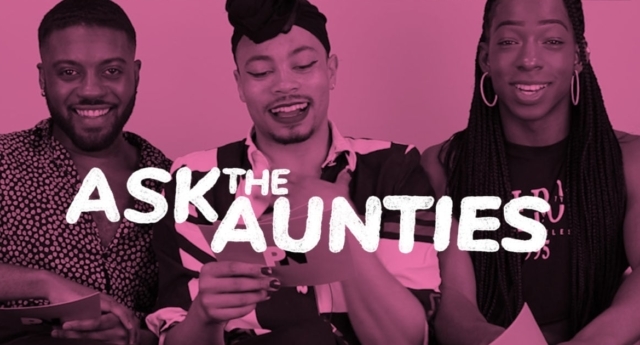 Subscribe to PinkNews on YouTube to catch new weekly episodes of Ask the Aunties.